The winter months definitely have less opportunities for food preservation than summer, but if you are itching for some canning, now can be a good time to stock up on bone broths. Yes, horrible, horrible pun intended. Making chicken broth is a great way to prevent any part of the chicken from going to waste, it’s good for you, and it’s way better than store-bought. Cook up a chicken or two, and hang onto the bones and scraps. Combine the bones and any leftover scraps of meat in a large stock pot with the rest of the ingredients and cover with water. These ingredients are as written in Ball, but you can be a bit flexible in making broth – you could also use a carrot if you want, throw in some parsley or garlic, or if you prefer, just make straight bone broth with no added vegetables. Bring to a boil, then reduce to a simmer. Now, just wait. Occasionally taste the broth; leave it simmering until it reaches the desired strength of flavour. Typically, I let it simmer for the better part of a day. A second way to make chicken broth is in the crock pot, and I can’t believe I didn’t think of it myself. I recently purchased 100 Days of Real Food, which is a great book by the way, and in it Lisa has a recipe for overnight chick stock in the crock pot. Dang, why did I never think of that?! Typically, I make a chicken for dinner, chuck the bones and leftovers in the refrigerator, and make the broth the next day because I don’t want to leave my burner on while I sleep (especially on my current stove – don’t get me started). This method is just brilliant because you can leave it over night and deal with it the next morning. The next morning it looks and tastes so delicious! To remove some of the fat more easily, cool the broth in the refrigerator, and then skim off the fat. Strain off the bones and vegetables. 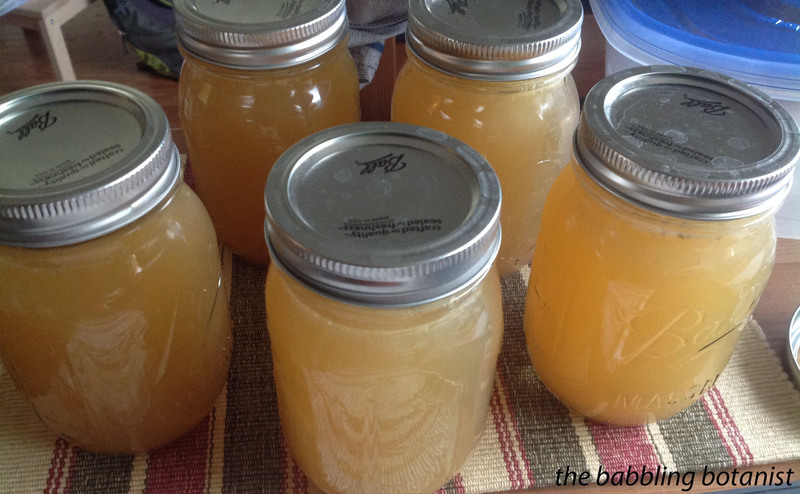 Broth can be preserved either through canning or freezing. If freezing, simply place the broth in a freezer safe container, leave some head space for expansion when it freezes, and place it in the freezer. 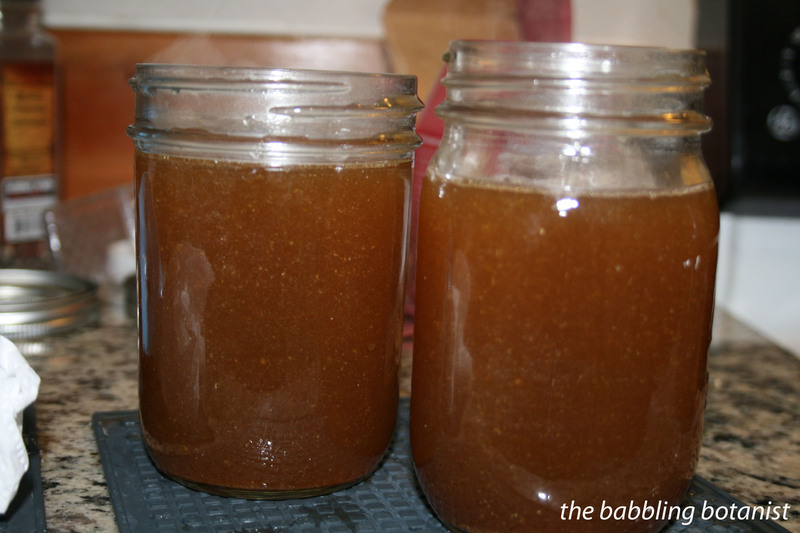 If canning it, prepare your pressure canner, jars and lids, and reheat the broth to boiling. Fill the jars, leaving an inch head space. Wipe the rims, apply the lids, and tighten the bands finger tip tight. Place the jars in the canner containing three quarts of hot water. As an aside, broth can vary in colour by what you have in it, how well you strain it, and how long you cook it, but it’s really just a matter or personal preference. I generally don’t strain it until it’s super clear (like though cheese cloth, just through a fine strainer), but if you want it nice and clear go for it. With all the jars in the canner, lock the lid in place and bring the water to a boil. Once a steady stream of steam is coming out of the canner, time 10 minutes of vent time, and then place the weight on the vent pipe. Bring the pressure to 11 psi (sea level with a dial gauge canner). Process pints for 20 minutes and quarts for 25 minutes. At the end of the processing time, turn off the heat and wait for the pressure to drop completely. Remove the weight, wait 10 more minutes, remove the canner lid, and remove the jars to a hot pad or towel. Cool 12-24 hours, remove bands, check seals, wipe clean, label and store. Ta-da! Way better than store bought! ← The botanist is back! I’v.e never canned just chicken broth but twice a year I cook a turkey, have a nice dinner with dressing and all the trimmings then freeze all the bones, skin, scraps and alot of white and dark meat. A couple of months later I simmer the bones, etc. with celery and onion several hours, thaw the turkey cut it up into bite sizes and make home made noodles. Strain the broth, add about six ribs of celery, one large onion, teaspoon of dried sage and two or three tablespoons of Knorr’s chicken granules, 1/2 cup Watkins dry turkey gravy mix. Throw in all the home made noodles along with the flour they are sitting in [ about 1 cup], stir vigorously so noodles don’t stick together and all flour dissolves without lumping. Boil gently for 1 to 1-1/2 hours just until noodles are done. Add turkey, pepper and correct seasoning and serve. My grown kids and grand kids love this more than turkey dinner.